Demolition underway on the interior. 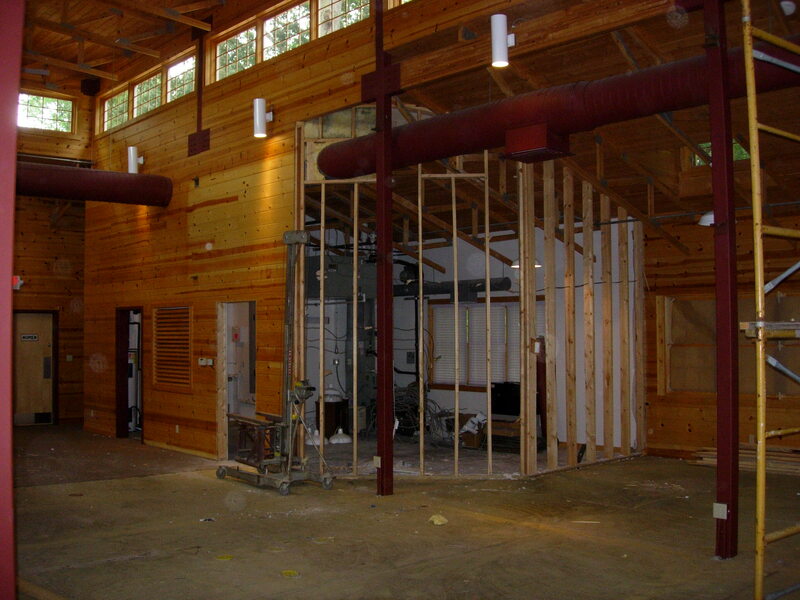 We are moving ahead with work at The Remnant Trust project in Winona Lake. Demolition is nearly complete and we have begun framing walls. An existing stage, an existing fireplace mock-up and miscellaneous display walls had to be removed. Most of the existing interior was finished in tongue & groove car siding. Let’s just say the original installer believed that if a whole lot of nails were good, even more would be better. The Remnant Trust Building. Picture from Scearce Rudisel Architects Website. Because of the type of protection for artifacts required here, special effort is being made for security as well as for Fire Protection and HVAC controls. The existing building previously housed the Billy Sunday Museum. The previous use has presented some challenges, but fortunately the original building construction was recent and most of the construction and existing systems are in good shape. There have been a few changes as we’ve gotten into the project, but as always, the plans prepared by Scearce Rudisel Architects have provided the necessary guidance. Mary Ellen Rudisel Jordan is always a pragmatic Architect and she works well with us. We both maintain the goal of achieving the best possible project for our mutual client. This looks like a cool project. Winona Lake fascinates me. I’d like to see more photos of how this project develops! I’m going to have to spring for a new camera! It’s tough getting interior shots that show anything once the rooms are framed. I need something with a wide angle lens. Thanks for checking in. I’ll try and put in an update after the site meeting next week.